Potatoes and salt are two elements that put together make one of the most satis-fying comfort snack foods around … French fries! Simple or smothered in cheese or gravy or sour cream, there’s just nothing better when you just want a nibble of something. These 10 places will satisfy your craving. This renowned sports bar is just the place for a plate of fries, a variety of ways. All are fresh and handmade. There’s the traditional thin style. Chile cheese fries are smothered in cheddar cheese and topped with either red or green chile. How about a little East Coast-style—Philly cheesesteak fries are also smothered in cheddar cheese but topped with Philly beef. Sweet potato fries are a tasty and healthy alternative. The kicker is Kristy’s wet fries—crisp, covered in brown gravy, and a Gallup tradition. So many choices! Fresh potatoes are the base for these hand-cut fries that come seasoned with either: Cajun, lemon pepper, parmesan, garlic, mustard, barbecue, Greek, or Jamaican jerk. You can also get sweet potato fries, as well as crispy cheese fries, topped with cheddar cheese, chives and sour cream—add green chile for an extra kick. The fries here, aka frites, are the pinnacle of fry-dom. Hand-peeled and cut fresh daily, they are then triple cooked to attain a perfect Belgian-style frite. They’re crunchy on the outside and mashed potato-y on the inside. Served in a cone with a choice of specialty sauces, also made in-house daily, that include: house-made mayonnaise with lemon, the delightfully mayo for garlic lovers known as aioli, a spicy mayo with a habanero-based pili pili sauce, spicy ketchup, and a blend of ketchup and mayo called Fry sauce. The only out-of-the-ordinary thing you’ll find here is extraordinary food and an exceptional selection of fries. You’ll be giving thanks for the Thanksgiving fries all year long—sweet potato fries, sweet whiskey butter, cinnamon and pecan smoked bacon. The garlic fries are pungent and spicy. 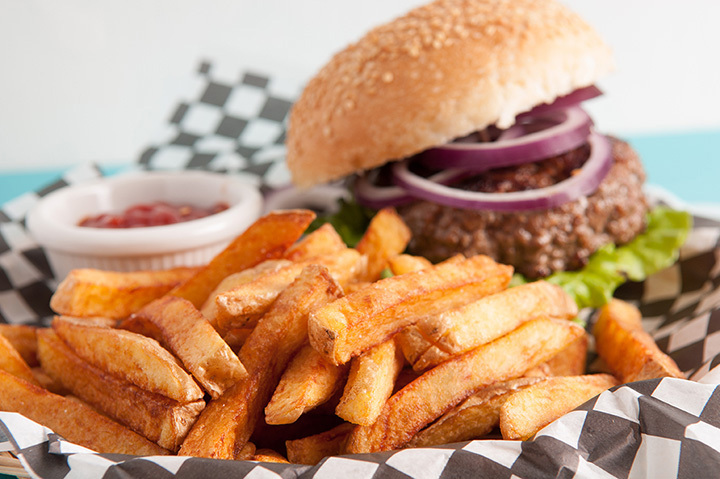 Of course, the regular fries are traditionally thin and perfectly cooked. Go for a beer, stay for the fries. All choices begin with fresh, hand-cut fries and then the fun begins: try them tossed in duck fat, sprinkled with orange zest and parsley, tossed in white truffle oil, sprinkled with Parmesan cheese, dusted with Cajun spice, smothered in a green chile cheese sauce, with Chimayo red chile and a lime wedge. Don’t miss the sweet potato with paprika, cinnamon and sugar. This modern-day diner is the progeny of the celebrated Plaza Café, a part of the Santa Fe dining community since 1947. With a blend of American, Southwestern and Mediterranean food, the menu is a smorgasbord of cultures. The fries are a tribute to Greece and begin with house cut fries that are then tossed in olive oil, a lemon and caper sauce, oregano and Feta cheese. Yes, this is a chain, but one that lives up to its motto: “The World's BEST Flavored French Fries! !” The choices are mouthwatering. Here’s the drill: order original, loopy, sweet potato, jo jo chips, chili cheese fries and even tater tots. Pick a flavor: barbecue, cheddar, sour cream, chili barbecue, cinnamon and sugar or garlic and parmesan. Choose a size: jumbo, mega, giga. Enjoy! If you’re looking for comfort food, this is the place. And it’s a really cool 1950s-style diner, right on Route 66. Doesn’t get much better than that for road trip food. Fries can be a stand alone meal and include: 66 fries, smothered with queso and chopped green chile, Fiesta fries, covered with Texas chili and cheese, cheddar fries, topped with melted cheddar, and wets, with brown or cream gravy. Nothing could be finer! Great food and a fun atmosphere is what’s happening at this pub-like hangout. A community bar table and expansive outdoor patio with game tables makes it a fun place. The great food is defined by fare like the FR8 Fries which come with a green chile gravy and old windmill dairy cheese curds. Don’t miss, however, the non-potato green bean Mancehgo fries that are tempura battered and served with a green chile barbecue aioli. The lobster tater tots with a Siracha cocktail sauce and jalapeno aioli are worth staying for too!